Just thought I'd better introduce myself. 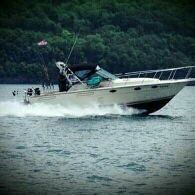 I've been fishing the north side of Lake Ontario for thirty years & running Blue Knight Fishing Charters for 25 years. I'm a member of the Ontario Sportfishing Guides Assoc. & the Ontario Pro Staffer for Hot Spot Fishing & Lures. I've been a member of Spoonpullers for a couple of years now. Now I've retired from Peel Regional Police I'll even have more time to fish. Good to be onboard! Welcome to the site BK. Get ready to have fun, eh? Finally ... some more boys in blue on the board. Welcome to the site.